Each tool is made from durable stainless steel and is rust resistant for long lasting use. 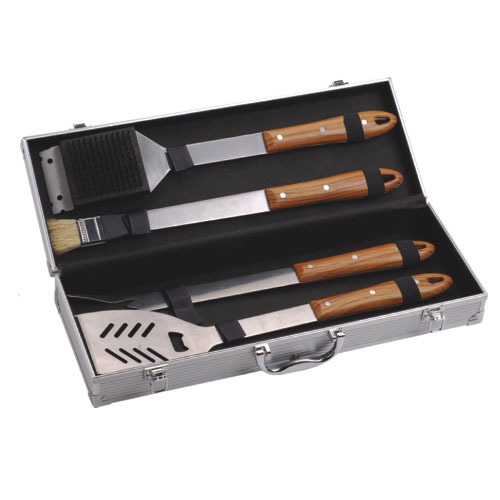 The set includes a variety of BBQ Tools like a slotted spatula, a Grill Cleaning Brush and a basting brush, and it also comes with a heavy duty aluminum carrying case for storage or travel.The natural wood handle give you a smooth hand feeling and more close to the nature.This complete set of barbeque accessories is an ideal gift for any avid griller or cook. It is perfect for Father`s Day, birthdays, Christmas, wedding showers, as a housewarming present, and more. Looking for ideal Heavy Duty Bbq Tools Manufacturer & supplier ? We have a wide selection at great prices to help you get creative. All the 4pcs Bbq Tools Set are quality guaranteed. We are China Origin Factory of 4pcs Bbq Set with Soft Handle. If you have any question, please feel free to contact us.